One of the best wine tasting experiences I have ever had!! A stunning place, great service, informative tasting, lovely wine and a relaxing vibe. I loved this place!! I just loved the feeling I had as I drove up to this estate. The long driveway with the destination at the end of the road always in view. The gorgeous Tuscan style building giving me that feeling like I am about to experience something very special. On a sunny day like it was today, I couldn't not stop to take photos and soak up the stunning grounds. As I walked up the stairs I was greeted by one of the staff, she pointed out where I can enjoy a wine tasting and where the bathrooms are. I took my time taking photos on my way in to the tasting room and then again as I found a table outside in the courtyard. This estate just has it all. From the building, to the staff, to the wine, to the music. They have the whole package down pat!! The only thing is, this place is such a nice place to hang out, it would just top it off if they served food. I could then spend the whole day here!! As it was, I spent two hours just enjoying a wine tasting. I felt so relaxed here. You can view the video I took at Waterford Estate on http://youtu.be/W_ls-nfDjjM. I took this video to take in the music, views and vibe at this estate. Waterford Estate was one of the first wine estates I visited when I moved to SA. I was therefore curious to see what my opinion would be on this place three years later. I left with an even greater feeling than the first time. It was truly memorable. A standard wine tasting is R40. The chocolate and wine tasting is R45. A Waterford Estate Library Collection tasting is R200 (pre-bookings only). The Jem tasting is R50. They also have a Waterford Estate Wine Drive at R550 per person (pre-bookings only). I did the wine tasting plus the chocolate and wine pairing (R65). 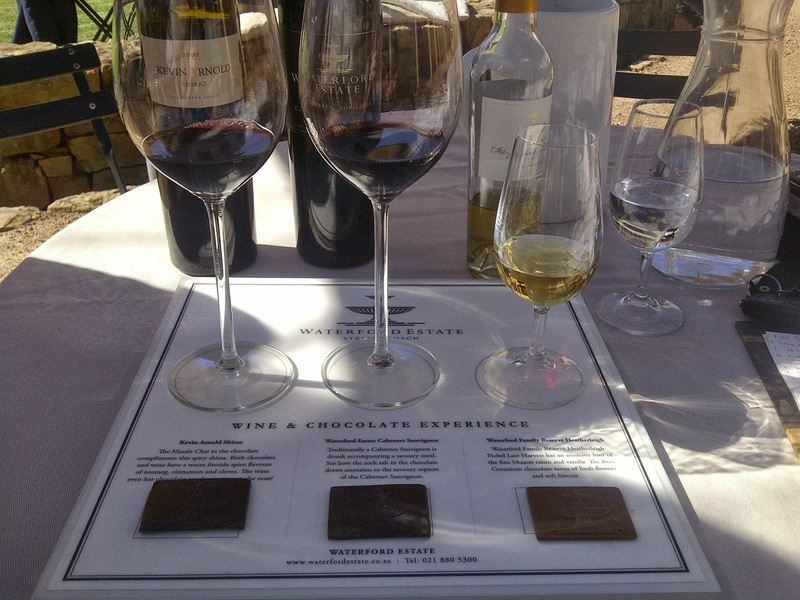 This chocolate and wine tasting is one of the best in the Western Cape, so if you do visit this estate, be sure to do this tasting. I was served by Jessica, she was very polite, welcoming and informative. I couldn't critique one thing about how she did the tasting, it was really well done and in a friendly and professional manner. First I tasted the 2012 Waterford Estate Rose Mary (R65 a bottle). This is a blend of Sangiovese, Mouvedre, Malbec, Barbera and Grenache. It had a lovely aroma, was smooth on the palate and refreshing. It was a nice light, off-dry wine with strawberry, peach and lime flavours. It had a nice lingering finish. I liked this wine. 2010 Waterford Estate Sauvignon Blanc (R95 a bottle) is from a single vineyard which is 25 years old. This wine spent 8 months on the lees. Had light-medium body. It was refreshing and very pleasant. It had light aromas with hints of apple and tropical fruit aromas (including pineapple and coconut). It was smooth on the palate. It was nicely balanced with low acidity, slight minerality, full mouth feel and a lovely finish. It was just stunning, a beautiful wine. I liked it!!!! 2012 Pecan Stream Chenin Blanc (R45 a bottle) is a blend of 95% Chenin Blanc with 5% Viognier. It had a gorgeous smooth, round, creamy nose. Slight apple and cinnamon on the nose. This wine reminds me of stewed fruit and custard (from the smell of the wine). What you smell is what you taste, so on the palate I also got stewed fruit and custard with a nice smooth feeling on the palate. This was a very pleasant wine with a slightly tart finish. It will be great with food. I liked this wine. 2011 Waterford Estate Chardonnay (R140 a bottle) spent 7 months in barrels; 30% new barrels and 70% 2nd fill. This wine had nice light Chardonnay characteristics coming through on the nose. Prominent pear on the palate. Very smooth and light wine. Unusual aftertaste. It was a nice wine but I am not sure if I like it because of the aftertaste. It was nice/ok. 2010 Pecan Stream Pebble Hill (R59 a bottle) is a blend of Shiraz, Mouvedre, Barbera, Sangiovese and Grenache. It was a little dry on the palate. Spent 14 months in 2nd and 3rd fill barrels. Blackcurrents and dark berry aromas. It was ok.
2009 Kevin Arnold Shiraz (R175 a bottle) had medium body, was a little dry, had a lovely nose, tight tannins, dark berry/blackcurrent taste, good lingering aftertaste, smooth, good wine, just a bit more serious than the others. Spent 16 months in new and 2nd fill barrels. I liked this wine. - this wine was paired with the Masala Chai dark chocolate. The chocolate was yum. It definitely pairs nicely with this wine bringing out the mocha and slight spicy flavours. 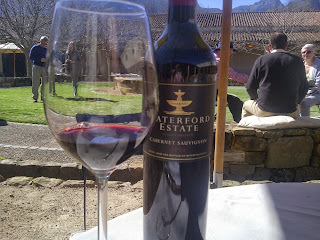 2010 Waterford Estate Cabernet Sauvignon (R165 a bottle) was a smooth wine!! It had nice aromas, was a little dry, medium body, nice berry flavours. It had a lovely lingering finish.This was a lovely wine. I liked it!! - this wine was paired with the Rock Salt dark chocolate. It also paired nicely. Neither the wine or the chocolate was too powerful in flavour and complimented each other nicely. N/V The Family Reserve Heatherleigh (R120 a bottle) had a lovely aroma of peach, honey and floral notes. Not too sweet but a little on the syrupy side. - This wine was paired with Rose Geranium milk chocolate. The chocolate was yum. It reminded me of turkish delight. The chocolate changed the wine slightly. It felt lighter with more honey and floral tones. During my wine tasting Kevin Arnold (winemaker and owner) came and introduced himself. It was pretty cool to be sitting at Waterford enjoying a wine tasting over a conversation with the winemaker himself. It is awesome to see that he is a hands on winemaker/owner who is on the farm and mingles with guests. On my way out a gentleman offered to help me carry my purchases to the car, I couldn't have had a better finish to my time at Waterford Estate. Truly perfection from start to finish!! What a wine estate, what an experience!! I highly recommend visiting this wine estate!! To the extent that if you have time to visit only one estate while in Cape Town or Stellenbosch, make this estate it! !